Why Are Clowns So Scary? I am sure you have heard the recent chaos around clown sightings around the United States. Teens all around the country have been posting videos either in their cars or walking through the woods, to find a random clown that inevitably starts to chase them. Whether these videos are actually real or staged to get retweets is up to the person. But some of these clowns have turned violent. Mississippi has even banned clown costumes until the end of halloween because the recent scare. Children in states like Pennsylvania, Ohio, New York, and New Jersey are being stabbed by these clowns. Schools have been closed due to some clown threats. And one boy 16 year old boy was murdered by a man in a clown costume. These clown stories kept getting more and more traction giving more attention to these scary clown threats. But why clowns? What makes someone with a painted smile so scary? But this past September, scary clowns have been taken to a new level. Clowns try to lure kids and passing by teens into the woods. There have been videos of clowns at the side of the road chasing passing cars. The internet blew up with videos of clowns in the woods and at the side of the road. Even here, at Penn State, we know all too well about the clown sightings. When a clown was reportedly seen and a mob of 500 students started chasing a creepy clown that was supposedly seen according to social media. Students running all through campus tried to find the clown and take it down. The cops had to try and keep control of the students. Police officials say there was no actual clown. Most of these clowns roaming the streets are meant as a joke but the small amount of clowns that pose a threat have people all over the place afraid to see a clown. Due to the wide number of people who suffer from fear of clowns it didn’t take much for these creepy clown sighting to blow up and tract so much heat. Hopefully as Halloween nears its end, so will these clown sightings. This entry was posted in Uncategorized on October 21, 2016 by Amira A. Oloufa. Clowns were never something I found to be the most pleasing things in this world, however, they were also never something I completely feared until the whole incident that occurred at Penn State a few weeks ago. It is fascinating like you said how clowns now have a complete turnaround from what they used to be known as- something funny and smiley to now scaring people and causing schools to be put on lock down. Last year in my psychology class I had to do an entire project on a murderer and although scary this criminal is interesting to read about being that he secretly dressed up as clowns to hide his identity- John Wayne Gacy. This is a very relevant topic due to recent events. On the east coast, mainly, there have been scary clowns going around trying to intimidate people. It’s all fun and games until someone gets hurt. A teenage boy was actually killed in Reading, PA. The guy ran up on some man and the man stabbed the 16 year old to death. This is a serious issue and getting worse. i find your post interesting, because clowns are my least favorite thing. Especially right now. But what i’m not getting from your post is the cause of the fear of clowns? 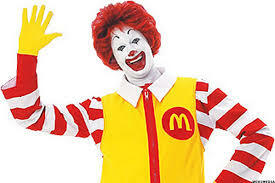 Right now, besides from the clown attacks, clowns are widely used at events such as birthday parties and fairs in order to bring joy, not fear. Is there a stereotype that automatically off puts off clowns? Ever since I was little, I have been afraid of clowns. An interesting point you made and something I never thought of was that people might be afraid of clowns because the paint on their faces hides their identity. I did some more research and found an article by the Telegraph (http://www.telegraph.co.uk/news/0/why-are-we-so-scared-of-clowns/) that discusses clowns’ history and why they are so frightening to people. Looking through the course blog I had to stop and read what your findings were because, well, I am in the same boat as others! I was at the clown hunt on campus that recently occurred, and it made me wonder 1) why it was happening and 2) why people are actually afraid of clowns. Clowns have been something I have always been scared of ever since I was little (I have a baby picture of me crying with Ronald McDonald to prove it). As I got older, I learned that they were seen to be funny characters for kids, but I never believed there was anything appealing about them. I wonder though the assets of clowns that make them so terrifying. I found this article on the psychology on clowns. They stated how the fear of clowns relates to the history even back to the 1800’s. They gave different examples of what happened in France, a mime (clown) had killed a child and that image of the “killer clown,” stayed within people’s minds after that! I have always found clowns mildly off putting, but until I read your blog I had never thought about it. I decided to expand on the research that you had already done and apparently in the middle ages clowns were not jokesters as they are now (kinda), but they represented danger and fear, which I find very fitting with the bout of clown attacks we are facing now.